On this playoff edition of Around the Brackets, we’ll recap quarterfinal action from Friday night. Blue Valley North 49, Gardner-Edgerton 28 – Defending Class 6A champion Blue Valley North raced past top-seed Gardner-Edgerton thanks to another big performance from senior quarterback Graham Mertz. Mertz threw six touchdown passes as the Mustangs overwhelmed the previously unbeaten Blazers. In the game, Blue Valley North receiver Cameron Burt set the Kansas high school single-season receiving record previously held by Prestyn Atherton of Sunrise Christian Academy. Burt’s new total of 1,576 yards passes Atherton’s 1,548 yards back in 2011. Burt has 85 receptions and 19 touchdown catches this season. Olathe North 24, Shawnee Mission East 21 – Olathe North scored a fourth-quarter touchdown to overtake Shawnee Mission East and advance to the state semifinals for the first time since 2015. The Eagles led 10-7 at halftime and traded scores the rest of the way. The Lancers led 21-17 with a touchdown early in the fourth quarter before Olathe North pushed across the winning points. Shawnee Mission East defeated Olathe North 35-28 in the regular-season matchup. Derby 38, Topeka High 7 – Top-ranked Derby trailed Topeka High, 7-0, at the end of the first quarter and then scored 38 straight to beat the Trojans, 38-7, in a matchup of Class 6A’s top-two offenses. Derby reached its fourth straight sub-state title game. The Panthers finished as 6A runner-up to Blue Valley North last fall. Hunter Igo accounted for three scores, while Tre Washington scored twice. Dax Benway returned a blocked kick to help set up a score and intercepted a pair of passes. Derby held Topeka’s outstanding ground game to 160 yards. Manhattan 41, Lawrence Free State 19 – Manhattan earned a mild upset in a road win versus No. 2 Lawrence Free State with a dominating 41-19 victory. Manhattan senior running back Kevontae McDonald recorded 35 carries for 237 yards and six scores. The Indians led 34-7 after three quarters and only allowed 87 total yards to the Free State offense all night. Highly successful Free State coach Bob Lisher told his team after the game that he plans to officially retire at year’s end. Lister, a coach for 37 years, has been Free State’s head coach since the program was formed in 1997. The Firebirds have made seven straight quarterfinals and overall reached six semifinals. The best season was a 6A runner-up in 2008. Lisher finished 148-85 with the Firebirds. St. Thomas Aquinas 30, Mill Valley 7 – Aquinas built a 27-0 lead and cruised to a 30-7 victory over Mill Valley. Tank Young rushed for 136 yards and two touchdowns and quarterback Tate Raboin passed for 141 yards and two scores for the Saints. Raboin hit Jack Gabel and Theo Grabill on touchdown passes. Gabel caught three passes for 86 yards. Once again, Mill Valley had no success rushing against the Saints’ defense. In two games this season, the Jaguars had minus-27 rushing yards on 44 carries against Aquinas. Olathe West 24, De Soto 7 – In its first year as a varsity football program, Olathe West is in the state semifinals after a 24-7 win at De Soto. The 11-seed Owls scored in each quarter in winning beating the Wildcats. Gavan McDaniel eclipsed the 1,000-yard mark with a 141-yard, two-touchdown night for the Owls. Meanwhile, Zac Krause passed for 106 yards and a score. Wichita Northwest 84, Bishop Carroll 67 – Wichita Northwest defeated Bishop Carroll, 84-67, in a wild contest that resembled a high-scoring basketball game. Northwest had beaten Carroll, 23-22, on a last-second field goal to open the year. Northwest, 5A’s top offense, tallied the most points in school history. Grizzly running back Breece Hall scored six touchdowns. Grizzly quarterback Reagan Jones set the school record with 28 passing scores this year. Carroll, plagued by injuries all season, received quite a performance from sophomore, third-string quarterback Aiden Niedens who threw seven touchdown passes. Northwest led Bishop Carroll 49-34 at halftime. Maize 28, Great Bend 21 – Great Bend led Maize, 14-13, at halftime, but Maize came back to win 28-21. The Eagles matched a 1990 semifinal showing for the best season in school annals. Both quarterbacks had big nights. Great Bend’s Koy Brack, against 5A’s top scoring defense, completed 22 of 40 passes for 310 yards with two scores. Maize’s Caleb Grill completed 14 of 23 passes for 273 yards and two TDs. Great Bend had 15 more plays than Maize and was plus-1 in turnover margin. Eagle running back Caden Cox delivered 26 carries for 130 yards as Maize had a slight 443-431 lead in total yards. Maize’s great defensive strength has come on third/fourth down and that continued. Great Bend finished 4 of 12 on third down and 2 of 7 on fourth down. Maize was 6 of 12 on third down and 0 of 1 on fourth down. Bishop Miege 55, Louisburg 21 – Miege scored 27 points in the first quarter in rolling past top-seed Louisburg, 55-21. Quarterback Sam Pedrotti completed 12 of 13 passes for 172 yards and three touchdowns, while Brison Cobbins rushed for 81 yards and two scores and also threw a touchdown pass to Phillippe Wesley. Louisburg, which played without injured two-way standout Austin Moore, managed only 68 yards of total offense but scored on a fumble return for a touchdown and a kickoff return for a touchdown. Basehor-Linwood 28, Paola 7 – Basehor-Linwood built a 21-0 lead in the first half in eliminating Paola, 28-7. Quarterback Dylan Mussett passed for 267 yards and three touchdowns with all three scores going to Jacob Coleman. Coleman caught seven passes for 125 yards on the night. Dylan Donnelly added 95 yards receiving on five catches. Nolan Ford led the ground game with 76 yards rushing. Paola managed only a Brendan Ohlmeier touchdown run in the third quarter to break the shutout. McPherson 62, Arkansas City 28 – McPherson rolled over Arkansas City, 62-28, and ended the Bulldogs’ Cinderella run as a double-digit seed through the playoffs. Jace Kinnamon rushed for 227 yards and five touchdowns on the night. Kyler Hoppes passed for 229 yards and threw four touchdowns – three to Gabe Hoover and one to Kinnamon. Hoover had nine catches for 139 yards and the three scores. Cevin Clark passed for 233 yards and two scores, but Ark City rushed for only 32 yards in the game. The Bullpups matched three previous semifinal showings, including last fall, for the best season in school history. Goddard 28, Wellington 14 – Goddard defeated Wellington, 28-14. Wellington, a winless season two years ago, finished 8-3 this fall. Wellington led 14-0 and limited Goddard to just four first downs in the first half. Then, Goddard scored four unanswered touchdowns in the second half. The game was tied 14 all when Ben Bannister scored a three-yard touchdown run with 2:05 left in the third quarter. Bannister added a 55-yard touchdown score with 9:35 remaining. Galena 42, Marysville 36, 2 OT – After falling behind 24-0, Galena scored 30 consecutive points to lead 30-24 late in the game before Marysville scored on the final play. The host Bulldogs went for the two-point conversion to win, but were stopped short by Galena sending the game into overtime. Each team scored in the first overtime, but neither could push across a two-point conversion attempt. In the second overtime, Marysville fumbled on their possession meaning Galena only needed a field goal to win. Facing a fourth-and-goal from the 1-yard line, Galena went for the touchdowns and senior quarterback JC Shelton scored from a yard out with the winning score. Shelton rushed for four touchdowns in the game and threw a touchdown pass to Nick Sarwinski. Sabetha 62, Parsons 18 – Sabetha exploded for five touchdowns in the second quarter in rolling to a 62-18 win at Parsons. Gabe Garber and Joe Gruber each rushed for three touchdowns in the first half as Sabetha pulled away for a 42-12 lead. Parsons scored on a 3-yard touchdown pass from Gage Friess to DaQuan Johnson right before halftime. Sabetha’s Braeden Cox returned an interception for a score to start the third quarter, Garber threw a touchdown pass to Ryan Stapleton, and Tristan Edelmen rushed for a touchdown to give the defending 3A champs a 62-12 lead after three quarters. Pratt 46, Smoky Valley 0 – Pratt defeated Smoky Valley, 46-0, in a battle of teams that entered the game undefeated. Both teams were 10-0 for the first time since the ‘90s. Pratt led 25-0 at halftime with three touchdowns from Travis Theis and a 25-yard field goal from Daniel Sanchez. Theis tallied six total scores with 96 passing and 206 rushing. Cort Elliott paced Smoky Valley with 17 carries for 108 yards. Andale 35, Scott City 14 – In a matchup of longtime powers, Andale beat Scott City, 35-14. Scott City quarterback Parker Gooden lost a fumble in the first quarter, and Andale running back Mac Brand scored. Brand rushed for 192 yards on 33 carries and finished with three of Andale’s five rushing scores. Scott City had four turnovers. The Andale defense held Scott City to 46 rushing yards on 17 attempts. Both teams entered the contest undefeated. Humboldt 24, Rossville 22 – Humboldt advanced to the state semifinals for the first time in school history with a 24-22, road win at Rossville. After trailing 10-8 at halftime and 16-8 in the third quarter, Humboldt scored on a Conor Haviland run to tie the game at 16. Haviland then intercepted a Rossville pass and returned it inside the Bulldawg 20-yard line. Daegan Goodner scored on the next play and added the two-point conversion run to lead 24-16. Late in the third quarter, Rossville scored on a touchdown pass from Garrett Carver to Tyree Sowers to pull within 24-22, but Humboldt stopped the two-point attempt. The two teams traded possessions in the fourth quarter without any scoring. Goodner led Humboldt with 115 yards rushing, while Haviland added 70. Carver rushed for 100 yards to lead the Bulldawgs. Riley County 40, Silver Lake 34, OT – Silver Lake led Mid-East League rival Riley County 34-21 with two minutes remaining in the game, but the Falcons rallied to force overtime. Garrett Harmison’s 66-yard touchdown pass to Mikey Waggoner pulled Riley County within 34-28, then the Falcons recovered the ensuing onside kick with a 1:30 left. The Falcons then scored on a touchdown pass from Harmison to Nic Allen to tie the score, but Silver Lake blocked the extra point. In overtime, Riley County scored first on an 11-yard touchdown pass from Harmison to Wyatt Earhart, but this time the PAT missed wide right. Silver Lake’s possession ended as quarterback Mason Griffen hit Wyatt Heiman on a fourth-down pass, but he was tackled just short of the goal line to end the game. The victory over Silver Lake was Riley County’s first over the Eagles since 1996. Harmison passed for four touchdowns, while Waggoner rushed for two scores and had the touchdown catch. Hoisington 30, Hutchinson Trinity Catholic 0 – Hoisington moves into the sub-state title and tied the best finish in school history with a 30-0 win versus Hutchinson Trinity, Class 2A’s second-best defense. Hoisington steadily pulled ahead in the contest. Hoisington led 6-0 and had a Xavier Robinson interception deep in Cardinal territory. The Cardinals led 12-0 after a Wyatt Pedigo score. He finished with 24 carries for 197 yards and three touchdowns, and Robinson tallied a late TD. Trinity had permitted just 70 points in the first 10 games this year. Hoisington lost at Phillipsburg, 51-21, in the regular season this year. Phillipsburg again will play host in the rematch. Phillipsburg 25, Conway Springs 24 – In what could possibly be the de facto 2A state title game, Phillipsburg held off Conway Springs, 25-24. Conway Springs intercepted Phillipsburg in the end zone but had to punt. Phillipsburg scored and tied the game at 18. Conway Springs then took a 24-18 lead with 21 seconds left in the third quarter on a 14-yard touchdown run. Phillipsburg scored with 7:55 left, and the extra point gave the Panthers a 25-24 lead. Phillipsburg has all-state kicker Jonathan Hunnacutt, the state career leader in kicking points. Conway Springs led 12-7 at the end of the first quarter and 12-10 at halftime. St. Mary’s Colgan 34, Jackson Heights 7 – Colgan used a strong defensive performance and a consistent running game to eliminate fifth-ranked Jackson Heights, 34-7. The Panthers took advantage of two first-half turnovers by the Cobras in building a 20-0 lead at halftime. Colgan quarterback Cade Simmons threw touchdown passes to Derek VanBecelaere and Cal Marquardt and Simmons rushed for three scores as well. Colgan’s line paved the way for 272 yards on the ground led by senior Conor Price’s 91 yards, despite playing in just the second game of his career at running back. Simmons passed for 96 yards, rushed for 85, and delivered four tackles including two for loss, despite playing defense for just the second game this season. Colgan’s defense held Jackson Heights’ Cooper Williams – a 1,500-yard rusher – to 39 yards on 16 attempts. The Cobras had two drives altered by penalties in the second half, including several personal fouls as frustrations mounted. Olpe 20, Centralia 18 – Olpe advanced back to the sub-state semifinal round by winning at Centralia for the first time. The two small school powers were tied 6-6 at halftime, but Centralia fumbled the second-half kickoff giving Olpe a short field. The Eagles took the lead on a 1-yard run by quarterback Colby Hoelting on fourth-and-goal. Olpe intercepted Centralia on the ensuing Panther possession and the Eagles eventually scored on the second touchdown pass of the game from Hoelting to Dawson McCarthy to take a 20-6 lead. Centralia scored twice late on a Kamble Haverkamp 10-yard run to pull within 20-12, and then Haverkamp hit Donavan Blagg on a 26-yard touchdown pass to pull within 20-18. Centralia’s two-point conversion attempt was stuffed by the Eagle defense as Olpe preserved the two-point lead. McCarthly caught two passes for 65 yards and two scores, while Hoelting passed for 80 yards and those two touchdowns. Kynden Robert led the Olpe ground game with 60 yards rushing. Smith Center 61, Sedgwick 27 – Smith Center rolled over Sedgwick, 61-27, and will face Plainville for the third straight sub-state game and sixth time in the last three falls. Smith Center defeated Plainville, 21-10, in a close contest in the regular season this year. The Redmen led Sedgwick, 41-14, at halftime and 47-20 in the fourth quarter. Three different Smith Center backs topped the 100-yard rushing mark on the night. 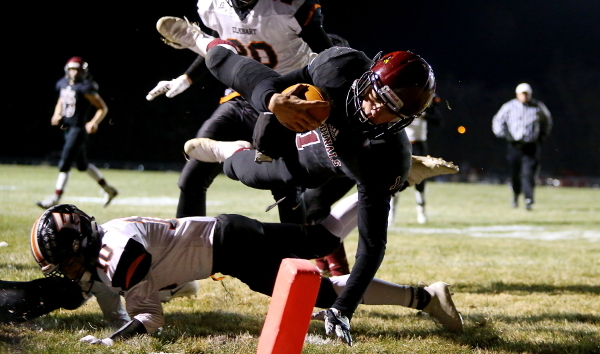 Plainville 29, Elkhart 13 – In Plainville, the Cardinals held off Elkhart, 29-13. The game ended on a somber note when standout Elkhart quarterback Lane Whisennand threw an interception late in the fourth quarter. Jared Casey picked off the pass and had a long return. Whisennand was knocked out of the game on a big blind side hit. He was put on an ambulance but was moving and was expected to be alright. Casey recorded 120 total yards and two scores, along with two interceptions. Jordan Finnesy recorded 97 rushing yards, 125 passing yards with three scores accounted for. He also intercepted a pair of passes. Plainville briefly trailed 7-6 early before it took advantage of several short fields and Elkhart mistakes to regain the lead. Solomon 14, Argonia-Attica 6 – All of the scoring came in the first half of this one as Solomon went on the road and escaped with a 14-6 win over the Titans. The Gorilla defense forced six Argonia-Attica turnovers including five interceptions to preserve their one-score victory. Solomon will now host their fellow District 4 and Wheat State League rival Canton-Galva in the state semifinal. Canton-Galva won the regular-season meeting 38-20 over the Gorillas. Canton-Galva 54, South Central 52, OT – Canton-Galva advanced to the sub-state semifinal round for the first time in 27 years with a 54-52, overtime, road win at South Central. The Eagles outscored the Timberwolves 20-8 in the second half to force overtime. South Central scored first in overtime, but was unsuccessful on their two-point try. The Eagles then scored on their possession and converted the two-point conversion for the win. Central Plains 54, Hoxie 6 – Central Plains held off defending state champion Hoxie, 54-6, and has permitted just 28 points, best in eight-man football – and on pace for eight-man’s top scoring defense in at least a decade. Hoxie ended the Oilers’ eight-game shutout streak. The game ended with 46 seconds left in the third quarter. Central Plains led Hoxie, 30-6, with 7:30 remaining in the second quarter, as Hoxie once again struggled with turnovers. Hanover 46, St. Paul 0 – Hanover cruised to its 36th consecutive victory by eliminating St. Paul, 46-0. The Wildcats led 30-0 after the first quarter before ending the game at halftime. Quarterback Daiken Stallbaumer passed for 135 yards and four touchdown passes on the night, and added a rushing score. Stallbaumer tossed two touchdown passes to Pete Peters and one each to Cade Cohorst and Colin Juneman. Hanover will now travel to Twin Valley League rival Axtell in a rematch of an outstanding first meeting won by Hanover, 50-42, earlier this season. Axtell 54 Waverly 8 – Axtell’s Hunter Koch returned the opening kickoff 64 yards for a touchdown then the Eagles scored four more times to take lead 40-0 at halftime. Quinn Buessing passed for 290 yards and four touchdowns and added a touchdown on the ground for the Eagles. Koch added four catches for 87 yards and two scores. The game is believed to be the last for Waverly coach Mike Hevel who announced plans to retire from the sidelines after this season. Osborne 54, South Barber 8 – Osborne rolled over South Barber, 54-8, in a game that was over at halftime. South Barber fell in the quarterfinals for the third straight season. The one-loss Bulldogs outscored the Chieftains, 32-8, after the first quarter and 22-0 in the second quarter. Senior Darnell Holloway had another big game with 4 of 5 passing for 106 yards and two scores, all to Kade Miller. He recorded 17 rushes for 143 yards and two TDs. Osborne rushed for 242 yards and five scores. Dighton 44, Otis-Bison 36 – Dighton, with just nine players on its roster, moved to 9-2 and won its eighth straight game. The Hornets defeated Otis-Bison, 44-36. David Cramer made an incredible 24-yard touchdown catch on 4th-and-13 with 1:09 left in the contest to secure the victory. The catch has already gone viral. Under heavy pressure, quarterback Blair Hoffman threw the ball up in the air to the end zone. Cramer and two Otis-Bison players jumped for the ball. The ball ricocheted off of the Otis-Bison players’ helmet, and Cramer, lying on the ground with a defender on top of him, caught the pass one-handed against the defender’s back. Then, Dighton intercepted Cougar quarterback Anton Foust in the end zone in the closing seconds. Dighton reached the state championship game two years ago and missed the playoffs last year, including a district loss to Otis-Bison. Dighton led 22-20 at halftime and led 30-20 in the second half.